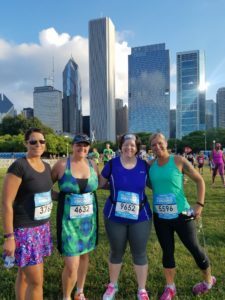 Girls weekend – Rock N Roll Chicago 2016 continued! Getting out and exploring the city is always a must do when we travel for races. Yes, we were there to run, but there is so much more to traveling for a race than just running! 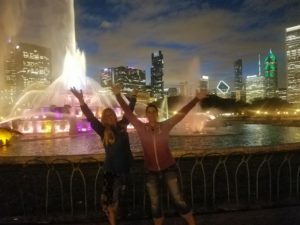 Last time visited Chicago, we stayed on the north side of downtown, so we had new areas to explore… or even revisiting some of the same areas because we had so much fun last time! We didn’t take time to explore the park today because we were on a mission to make it to Navy Pier. 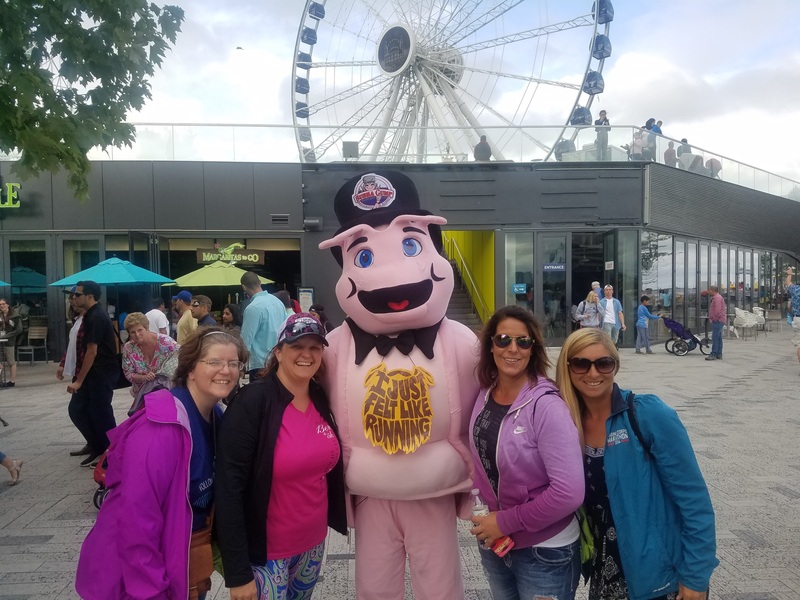 We realized that we just happened to be visiting Chicago on the 100th Birthday of Navy Pier and there were various special activities throughout the day. We heard there was cheesecake, so that was our motivation! Playing in the parks could wait! We were on a mission! By the time we made it to the pier, it was later afternoon and the place was hopping! We debating taking a ride on the ferris wheel but decided to keep wandering. And then we saw something we never woudl have imagined seeing… a giant shrimp walking towards us! Yes a giant shrimp from Bubba Gump Shrimp Co! So of course, we had to stop and capture the moment! After our photo opportunity with the shrimp and wandering halfway down the pier, Tracie was determined to find this cheesecake they talked about. So we found the information booth to ask about activities and where the cheesecake was. The only activities left for the day were fireworks at 9:30 with a champagne toast. The cheesecake was served at 10am and was long gone before noon. No cheesecake for us. So, I guess it was time for dinner and heading back to the hotel. Even though we headed back to the hotel, the evening did not end yet! Around 9pm we headed back out to head to the fountain for the light show! 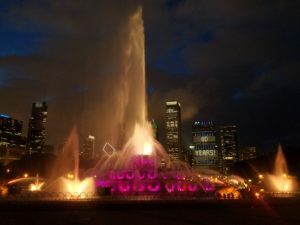 During the day, there are always water displays going on at regular intervals, but at night, starting at about 9pm, the light and music shoes run every hour, on the hour, for about 20 minutes. We wanted to make sure we saw this – and we were NOT disappointed! Between the shooting water, amazing light show and glow of the city lights all around, this was the best place to be after dark! Being able to walk across the street from our hotel to get here was definitely a perk to where we were staying! We spent the next 20 minutes taking in the fountain from all sides, enjoying the patriotic music that was playing through speakers around the fountain and enjoying the perfect summer evening! But then it was time to try and figure out where we wanted to park ourselves for the fireworks. We knew that we were not heading back to Navy Pier (we had enough walking for the day and bedtime was fact approaching since we had a race the next morning!) and there were so many street lights down by the marina that we were afraid they would ruin the view. Instead we headed back across the street into the park to find a spot! 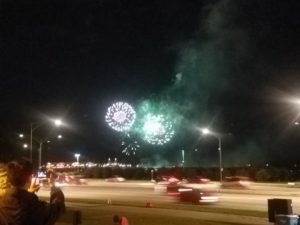 In the end, we probably would have been better off on the marina side of the road, since we ended up with the lights from the cars on the road between us and the fireworks but is was still and awesome show and a perfect way to end our first night in Chicago! Race day was finally here! Early morning alarms, prerace rituals complete, shoes laced up and we were off! The sun was shining and there was a cool breeze, but we knew that it was going to get warm quick. 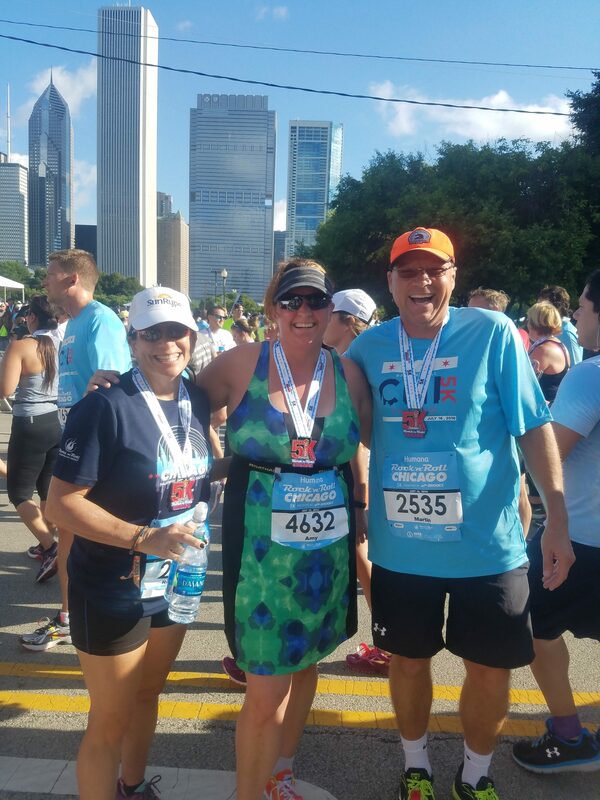 We were just hoping that we could get the race finished before the heat and humidity got too high. Once again, from an organization stand point, Rock N Roll did not disappoint. There was water and fruit available in case you needed that extra prerace hydration or fueling. We headed over to gear check and dropped off our bags (gotta have those flip flops handy after finishing any run!) and started to get ourselves ready for the race. For me, prerace today also had another meaning – I was on a mission to find some friends that I knew were here running from California. After a few messages back and forth, I managed to find Martin and Diane in corral 4, 5 minutes before the race was starting! I first “met” these two via Twitter about 2 years ago and we have been following each others running adventures for the last few years. Martin was also the one that wrote my training plan that I used last summer for my summer adventures! I almost got to meet them when I was in California in January, but I ended up missing them by mere hours as they were on a plane to Miami shortly after my flight landed. This time we were in the same city, at the same time, for the same race and even staying at the same hotel! We were determined to finally meet face to face! Not only did we meet up, but I had the opportunity run with them too! Martin and I ended up running the entire 5k together! 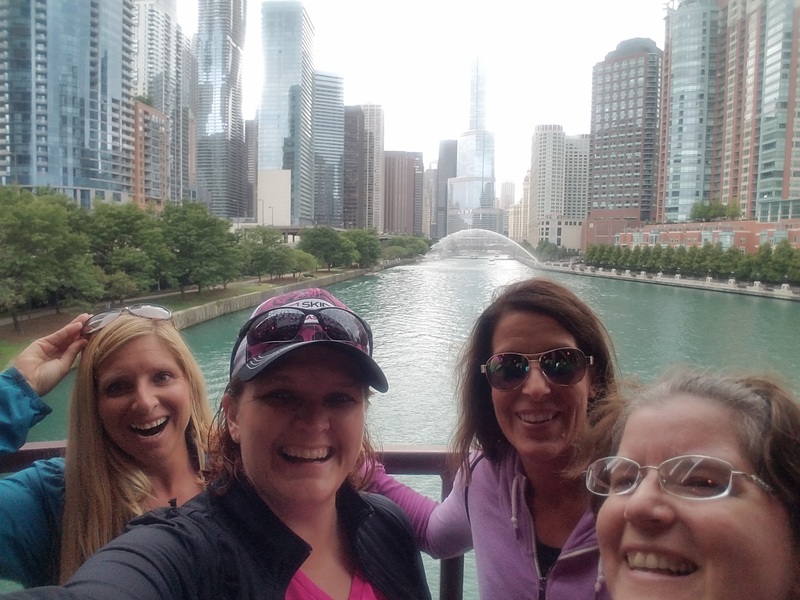 We spent the entire 3 miles laughing, comparing race stores, travel adventures and everything else, that before I knew it, we were around the corner from the finish line! Finally getting the chance to meet and run with Martin and Diane! Unfortunately, the heat and humidity did not play nice. About the time that the race started, the weather started getting warm. 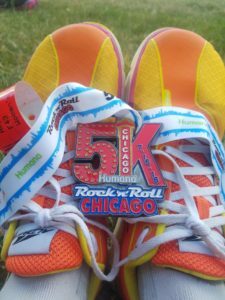 Thankfully, RnRCHI had ample water stations along the course, just wish there was more shade along the course! In the end, it was an awesome morning to run in a beautiful city, with amazing friends! Oh yeah, the bling was pretty awesome too! After showers and relaxing, it was time to hit the city again! First two things on the agenda today, visiting The Bean… and lunch. Not necessarily in that order! As we walked up Michigan Avenue towards Millennium Park, we started scoping out options for lunch (as well as a Walgreens so that Darci could get some bandages for her blisters) and before we knew it, we were at the park. 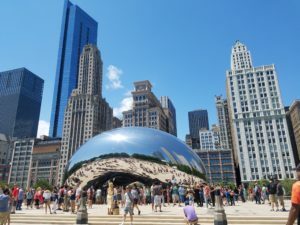 So we opted to have lunch at The Plaza at Park Grill – outdoor dining with supurb view of the Bean up above! This outdoor restaurant features a variety of classic summer items with the chef’s own flare! I had a the turkey wrap with was amazing! The rest of the crew enjoyed their entrees just as much as I did, all while enjoying the summer sun and cool breeze! After lunch, we headed up to The Bean for the traditional touristy pictures of our reflections in the polished surface of this amazing structure! Since we all have visited here before, we didn’t stay long and we off on more of our adventures. 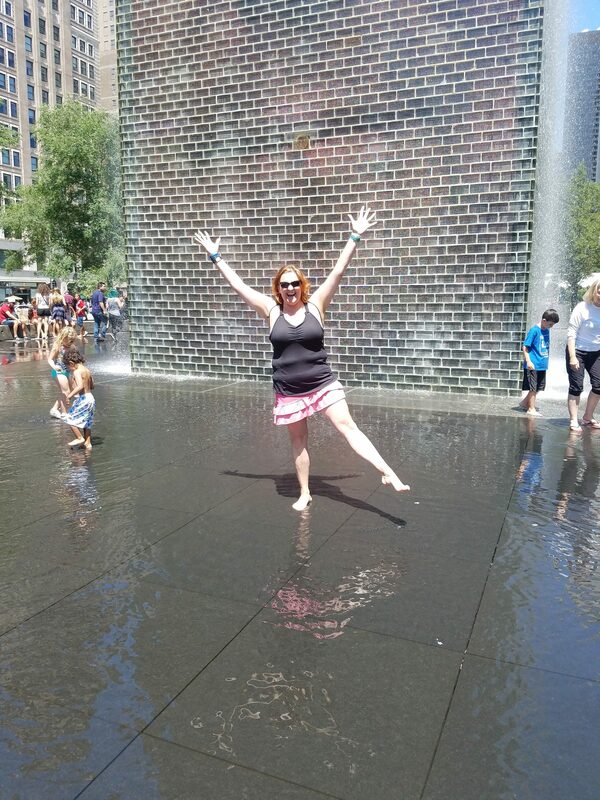 We wandered right around the corner to Crown Fountain to play in the water! This interactive water attraction is a favorite stop for locals as well as tourists! It’s a perfect place to stop and unwind, cool your feet and just have fun! The 2 large glass/brick towers display rolling images of faces of ordinary people. Every once in a while, the fountains turn on and the towers acutally look like someone is spitting water out into the pool. As we were playing around and taking pictures, Robin was in just the right spot that she ALMOST got it by the water! With as warm as the day had turned, the water felt great on my feet! but since we had a whole city to explore, it was time to move on! Next stop – Maggie Dailey Park! The first thing I saw when we ended the park was the climbing walls! What an awesome challenge! 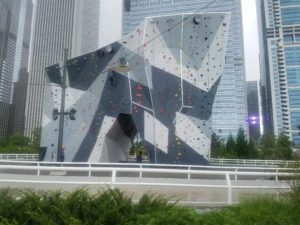 The last time I was on a climbing wall was 10 years ago – on a cruise ship in Alaska! I will definitely have to come back and give this a try one of these days! Climbing a rock wall with the Chicago skyline around you – too awesome! As we kept walking, there was so much to this park to explore that we could spend all day here! Every time we went around a corner, there was another area with new things to do. Each section was marked with what ages each section was geared for. The best part was, each section was separated from others by trees, shrubs and other natural foliage! Slides, rope walls, mirrors, lookout points… you name it, it was probably hidden in that park somewhere! After we spent part of the afternoon exploring, it was time to kick back and relax! 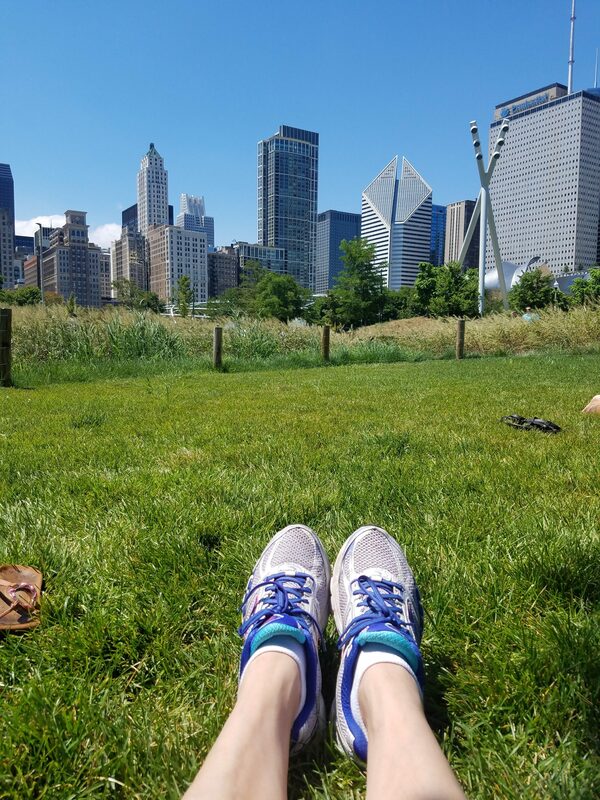 Laying back on the cool grass, enjoying the quiet in the city was just what we needed to recharge and get us ready for the rest of the afternoon! 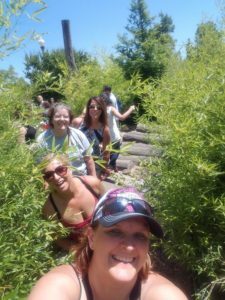 After relaxing in the part for a while, Tracie and Darci headed off in one direction and Robin and I another. We were on a quest to wander around downtown for a while, catching more of the sights. It was a beautiful Saturday afternoon and the city was full of activity! Bridal parties taking photos in parks, groups enjoying a few cocktails on their yachts in the river, riverfront restaurants with plenty of hustle and bustle and other people just out enjoying the afternoon. Before we knew it, it was time to head back to the hotel so that we could get ready for dinner and get some sleep before the big race the next morning! Finally, the morning of the big event finally arrived! 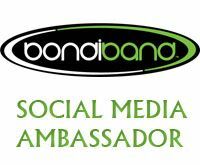 We were up before the crack of dawn and getting ready for today’s event! We were preparing for a warm one! Weather forecasts were predicting high temps and humidity for today so we were doing what we could to be ready! Armed with salt stick tabs, margarita Clif bloks and my Huma Chia gels, we made our way to the start line! Up before the fountain even woke up! Good morning Chicago! We were actually at the park before the fountain was even awake! 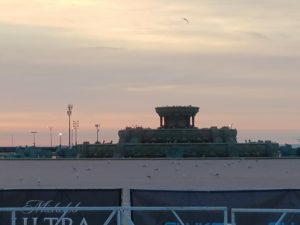 Seeing Buckingham Fountain without the water shooting up and lights on was a completely different experience than what we saw the on Friday night! The streets around the park were blocked off already and everything was so peaceful. Thankfully, the weather for the morning was not what they anticipated! It was cooler than expected so we were not going to complain We quickly made our way through the park, dropped our bags and gear check and made out final preparations for the race! Since we were down at the park early enough, we were able to drop our bags, visit port-a-potty’s without too much wait and get to our corrals with plenty of time to stretch and relax. Traditional pre-race photo at the start line! Ok, here’s the scoop. I didn’t take any pics along the course today… I just wasn’t inspired to do so. After all of the half marathon’s that I have run over the last several years, this one has, by far, left me the most uninspired. The course itself is relatively flat with just a few short hills. Perfect to try and hit that half marathon personal best or just enjoy and nice run. 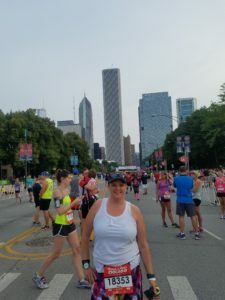 Running through the streets of Chicago was fun, but once the race made it past mile 6 and started heading further south, all of the awesome architecture and skyline of Chicago was behind us. I know that it was a safe course, but some of these areas were NOT areas that I felt I would want to visit again. I was thankful to start heading back north and head back towards downtown. 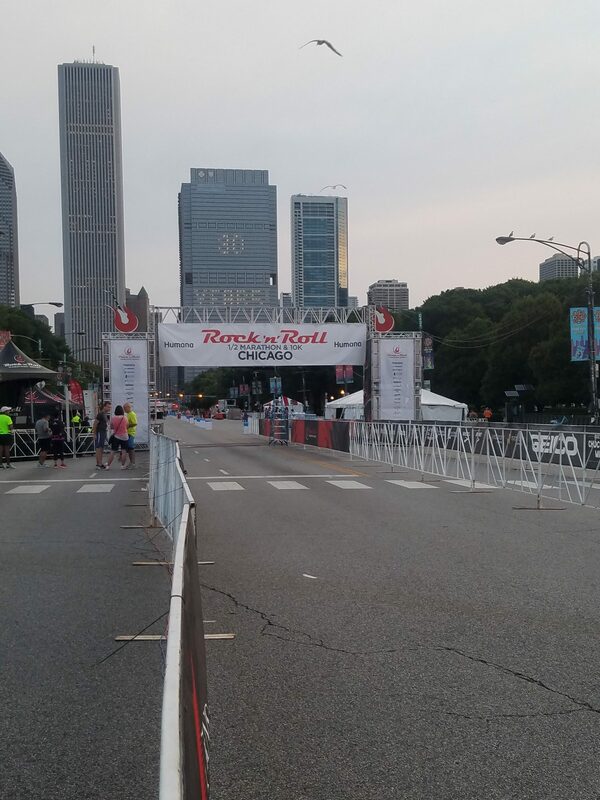 From everything I read about this race, the course would be filled with bands, festivities and crowds. Don’t get me wrong, the crown support was amazing, but the on course entertainment was not what I expected! I think I recall seeing maybe 4 bands on the course… maybe 5. Not the 15-8 that were on the race map posted on the website. Yes, I understand that there was forecast of rain for the day, but to have only 1/3 of the on course entertainment was more than disappointing! About the time that I crossed mile 11, it started to lightly rain. The cool rain was actually very inviting after the crazy warm days we had all weekend. But I quickly realized that we were in for some nasty weather. There were race officials warning spectators to take cover. I was a mile from the finish line. I was determined to finish before the storm! 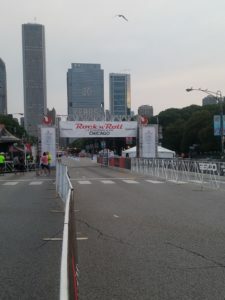 As I approached the finish line, I could hear the announcements over the speakers again warning people to take cover. It was going to get worse before it got better! Um, it’s a park, there’s not really a lot of places to take cover! I pushed forward and crossed the finish line. Within about 20 seconds after I crossed the finish line and got my medal, the skies opened up and I felt like I was in a monsoon! I grabbed a water and some snacks and started heading to the other end of the park for bag check. Along the way, I passed a few hundred people huddled under tents, trying to take some cover from the storm. My original plan was to change into my flip-flops as soon as the race was over, but with how wet everything was, I needed to save those dry shoes for the trip home! With gear check in hand, I quickly found the girls and we headed for the dry, warm hotel room! No post race selfies at the finish line. No finding some random person to give my beer ticket to. By this time, all we wanted to do was get into dry clothes… and then find food! I did hear that after I finished, they did pause the race for about a half hour, making runners take cover under bridges etc until the storm passed. Really glad that I finished when I did! After this, they did actually start the past-race party, but we were long gone from the park. We spent the rest of the morning trying to figure out how to pack off of the stuff we accumulated over the last 3 days into our luggage (yes there was some jumping on bags to get zippers closed), found some lunch and headed to the train station. Thankfully it was an uneventful train ride and then car ride from Kenosha. Rock N Roll Chicago was complete! While it is always fun to hang with the girls, travel to new cities and run crazy race challenges, I an not sure that I will run this series again in Chicago. Ask me to to run Rock N Roll Vegas or some other city, maybe… but I’ll probably pass on Chicago. Rock N Roll Chicago Remix Challenge Complete! Great recap! You guys did a good job of really soaking in Chicago! 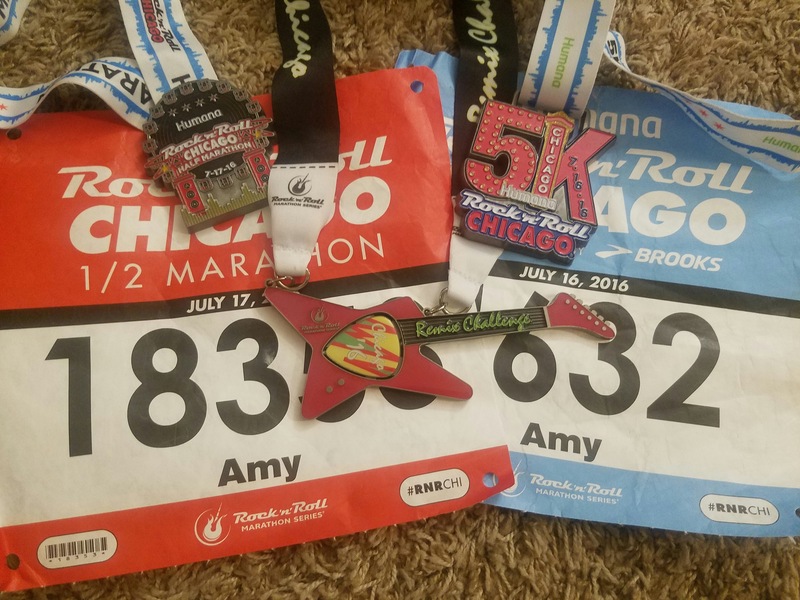 I missed much of Chicago this year because of the concert but did SO enjoy meeting you and so glad you guys ran together. So was he :). Great pics! Where did you take the top picture? Thanks Diane! Meeting up with you two was definitely a highlight of the trip! Let’s not wait 2 years to run together again! I always make a point to explore any cities I visit as much as possible! You never know when you are going to find your new favorite place! I am assuming you are referring to the top photo in this post? If so, that was taking on the bridge along Lake Shore Drive, right near Navy Pier!